The wedding is a new beginning for Marius and Cosette, but it’s the beginning of the end for Jean Valjean. Fortunately, Thénardier tries to blackmail the happy couple. If M. Gillenormand has gone overboard with joy and opulence, Valjean has fallen into despair. He leaves the wedding early and agonizes all night. In part, he’s concerned that his legal troubles might still spill over onto her. But it turns out after all these years of being a good person, doing good works, helping people, and so on, he still believes he’s the horrible no-good piece of scum who tried to rob the bishop. Now that Javert’s gone, Valjean has taken over his role, apparently having internalized Javert’s opinion of him. At his most charitable, he feels like he’s manure used to help a beautiful flower grow. Once again, it comes down to identity. As far as he’s concerned, only what he’s done as Jean Valjean really represents himself. Any good he’s done as “Madeleine” or “Fauchelevent” doesn’t count…and his conscience will no longer allow him to live under a false name. This is the point where I really have trouble agreeing with Valjean’s decisions. Philosophically, if you do good deeds for a good reason, you’ve done the good deeds. Saying that doing good pseudonymously doesn’t matter is like saying that doing good anonymously doesn’t matter…and yet people will often do so because they want their deeds to speak louder than their names. Conversely, you’d have to accept that evil done under a false name doesn’t accrue to your soul, and I can’t imagine Jean Valjean agreeing with that. So, the morning after the wedding, not having slept all night, Valjean goes to speak with Marius and starts trying to socially separate himself from Cosette as well. Marius hasn’t slept all night either. (Bom-chicka-waaaa!) Later on, Cosette wanders out of their bedroom, hair all messy. He tells Cosette to call him “Monsieur Jean” instead of “father,” starts addressing her formally as vous and Madame, refuses to move into the Gillenormand household even though he’s been invited, visits only in the dampest first-floor room, etc. “You mean that you’re no longer my father? You’ll be telling me next that I’m not Cosette!” Well, technically, you’re not…Euphrasie. Cosette starts spending time with “new acquaintances brought to her by marriage.” WHO? 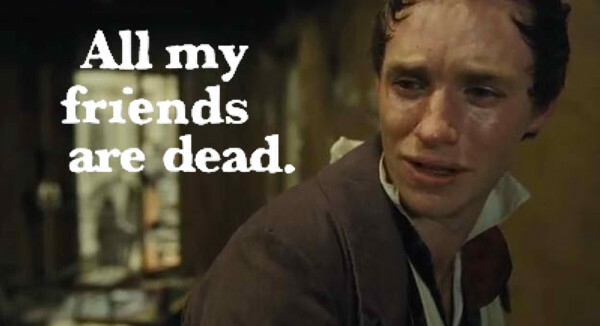 All of Marius’ friends are dead. Toussaint, the live-in servant whom Hugo doesn’t mention that often, goes with Cosette, and eventually quits because she doesn’t get along with the Gillenormands’ maid. This leaves Valjean alone in his home and Cosette with one less link to her past. Marius goes back and forth as to how much he trusts Valjean at this point. But ultimately, he believes that Valjean murdered Javert, and becomes more and more convinced the money in the trust fund is the loot from Valjean having defrauded M. Madeleine. This drives even more of a wedge between them: Valjean feels himself unworthy, and Marius starts making him unwelcome. Eventually, Valjean can’t bring himself to knock on the door. Then he can’t bring himself to walk past the street corner. His walks get shorter and shorter, and eventually he stops leaving the apartment altogether. After a while he stops eating. Cosette thinks he’s just gone off on one of his mysterious trips, a fiction encouraged by the fact that Valjean has instructed the doorman to tell people he’s not at home. Valjean’s decline in the musical is shockingly rapid. Here it’s slower, but much, much sadder. This is what dying of a broken heart really means. Thénardier shows up at Marius’ office dressed in a costume rented from a man who specializes in providing outfits for criminals. No, his name isn’t Gambi. Marius has done his research, and not only does he see through the disguise, he tells him point blank, “I already know what you’re going to tell me.” Thénardier, trying to regain the upper hand, proceeds to show him newspaper clippings proving otherwise: That Madeleine was in fact Valjean, that Javert survived the barricade after being spared by one of the rebels, only to be found drowned the next morning. What a switch: He makes a point of providing printed evidence, because it’s so much harder to forge than handwritten evidence. “The words murderer and thief, which Marius had thought disposed of, came like a cold douche.” Yes, Thénardier is a douche. I think we can all agree on that. Of course, the master-stoke of showing the piece of torn fabric from the “murder victim’s” coat is foiled when Marius walks over to the closet and pulls out his old coat to show that the piece matches exactly. Marius decides to hand Thénardier some money anyway to settle his long-standing obligation, and urges him to start an honest life in the Americas. He does go to America, but he goes into the slave trade. With Thénardier’s information, Marius finally understands what’s been going on, and he and Cosette go to see Valjean in person. Valjean is on his deathbed, having not eaten in days, but brightens at their arrival. He can hang on a few more minutes. “‘I told you the truth,’ said Valjean. ‘No. The truth means the whole truth, not just part of it. Why didn’t you tell me that you were Monsieur Madeleine and that you had spared Javert?” Probably because you might have talked him out of leaving. Cosette: “I won’t allow you to spend another day in this horrible place.” Valjean: “Certainly I shan’t be here tomorrow.” Gallows humor isn’t something I really associate with Valjean, and yet here it is. The “forbid me to die” exchange is also in here. Jean Valjean’s “last confession” is a description of the manufacturing method for making those glass beads and bracelet clasps. At one point he interrupts their last-chance reunion to point out something he forgot to write down. It seems a little odd at first, but it was the fact that Marius believed Cosette’s fortune to be ill-gotten that drove his side of the schism. Apparently Valjean never told Cosette her mother’s name until now. You’d think the Thénardiers might have mentioned her once in a while, but then she has blocked out most of her early memories. He also remarks on the Thénardiers being wicked people whom they must forgive. Did he just come to that conclusion now, or was he willing to forgive them already but not himself? Marius doesn’t interrupt…it’s a dying man’s monologue…but I have to wonder if he caught the reference. The name doesn’t seem to have come up when he asked Cosette about her childhood, and I imagine it would have come as a shock to realize that they share still another connection. Valjean dies happy, his face lit by the two candlesticks, after months of easily-preventable sadness. All he had to do was tell Marius the whole truth instead of just the bad parts. He might still have chosen to live apart, as he did at the Rue Plumet, he might still have struggled with depression and his conscience, he might even have still died within that year…but he didn’t need to make himself unwelcome to the only people who made him feel life was worth living. Following Jean Valjean through despair to his death reminds me of two things: First, the old adage to count no man happy until he’s dead (variously attributed to Sophocles, Herodotus and Solon). I recently read a post by Robert J Sawyer on killing characters, which probably primed me to think of it. Second, the aspiring writer in the first volume of Neil Gaiman’s Sandman, who had figured out the secret to happy endings: You have to know where to stop. Otherwise, all stories end in death. He lived; and when his dear love left him, died. And that’s it. It’s been a long, long project, and I can’t believe it’s done. I didn’t feel like I was really finished when I read the last page, but now that I have a full series of commentaries — within the calendar year, no less — it actually feels complete. I don’t think I’ve ever finished a blog before. Abandoned, sure, but not concluded. I do still want to re-watch the movie now that I’ve finished the book, and I’ll write up some thoughts on that, and there’s going to be polishing to be done on the site: fixing typos, cross-linking articles, cleaning up the leftover boilerplate text from when they were on my other blog, things like that. And who knows? I picked up the new Christine Donougher translation, The Wretched, because the Kindle edition was only a dollar. I might read that next year. Though if I do, I’ll probably confine myself to a single post, or at most one per volume. If you’d like to continue reading my thoughts on other subjects, please check out K-Squared Ramblings, where I talk about life, tech, and geek interests, or Speed Force where I write about comic books and superheroes, particularly the Flash. Thanks for following along with me on this journey, and I hope to see you elsewhere online! Follow @ReadingLesMis on Twitter or @KelsonReads@BookToot.Club on Mastodon. This entry was posted in Book Commentary and tagged Aliases, America, Cosette, Death, Dilemma, Graveyard, Jean Valjean, Marius, Paris, Thenardiers, Toussaint on December 31, 2013 by Kelson Vibber. Your Les Miserables blog was quite impressive and I enjoyed reading along each part as I finished it in my re-reading of the novel. I found the end (which I just finished two nights ago) to be much more emotionally heart tugging than the first time I read it. I have a tendency with these long classics to start speeding up and read very fast once I get close to the end, perhaps this time I slowed down enough to enjoy it. Then there is the whole idea of Jean Valjean as a Christ-like figure, which did not much occur to me the first time around but I kept thinking of this time. His seeming celibacy struck me. Here he is this almost god-like figure for most of the book, but no woman? Also, by the end Hugo is telling us that Valjean is 80 years old and has only been raising Cosette for 10 or less years. That seemed a little off – don’t want to go back and check, but was he really 70 when he went to get her? 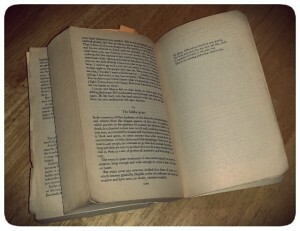 Oh well, it is definitely one of the best books ever, only really comparable to War and Peace, I think. Yeah, the end is especially sad when you slow down and really follow it. I remember feeling like I needed to rush through the last 100 pages or so, partly because it’s all aftermath and the musical shoves it into about 10 minutes (and most of the movies skip it entirely, which is a shame). And I’m seeing the Valjean/Christ comparisons too this time through especially since listening to the Les Mis Reading Companion podcast as she points out parallels and connections. As far as Valjean’s age goes, I seem to recall he’s around 55 when he adopts Cosette, making him around 65 at this point. Since his days as Madeleine he’s been in better shape than most men his age, making him look younger (except for the white hair). I think Hugo was describing his rapid decline in health to the point that he *looked* 80 just a few months after the wedding.